The future of the automobile is cleaner than ever, thanks to vehicles like the 2016 Toyota Mirai sedan – a hydrogen-powered fuel cell electric vehicle (FCEV) that emits only water. And to help demonstrate this future to Canadians, Toyota is welcoming three Mirai FCEVs to Canada. These production models – already on sale in Japan, California, and parts of Europe – will be part of a cross-country awareness campaign. Starting this month at the Montréal International Auto Show, Canadians can learn about FCEVs and how they can help reduce greenhouse gasses. The Toyota Mirai is part of the advanced technology vehicle display in the Toyota exhibit at the Montréal International Auto Show – January 20-29, 2017 at the Palais des congrès. The Toyota Mirai is a real-world vehicle – already on sale where sufficient hydrogen refueling infrastructure exists. It’s a clean, efficient vehicle that’s fun to drive and easy for owners to adopt. It has a range of approximately 500km and takes only five minutes to refuel with hydrogen. Toyota’s decision to introduce the Mirai awareness campaign at the Montréal International Auto Show also highlights Mirai’s exceptional cold-weather performance, and Québec’s role as one of the world’s leading hydrogen producers. This ongoing Mirai awareness campaign will underscore the need for Canada to develop the infrastructure required to support FCEVs and other advanced technology vehicles that will help decarbonize the auto industry. FCEVs are powerful and clean: The Mirai’s fuel cell mixes hydrogen with air, resulting in a chemical reaction that produces two things: electricity and water vapour. The electricity powers the vehicle, while the water vapour – the Mirai’s only byproduct – exits through the tailpipe. Toyota’s commitment to helping societies reduce their greenhouse gas emissions is part of the company’s long-term global Environmental Challenge 2050, which includes the New Vehicle Zero Emissions Challenge, aiming to reduce CO2 emissions of new vehicles by 90 per cent compared to 2010 levels, plus five other climate change and natural resource recycling initiatives. 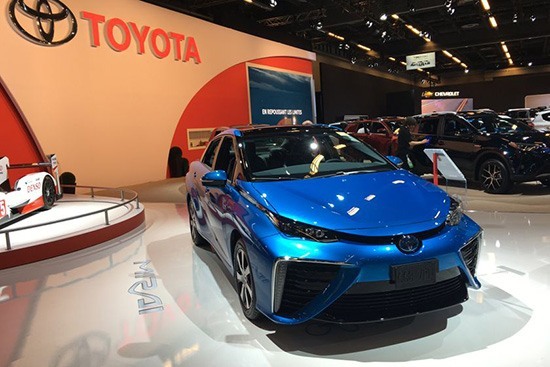 To facilitate the widespread adoption of hybrid vehicles and support development of innovative fuel cell technologies around the world, Toyota has released more than 5,600 royalty free fuel cell-related patents, including critical technologies developed for the Toyota Mirai. Stay tuned for more updates on Toyota’s Mirai awareness campaign as it continues throughout the year and beyond.